THROUGHOUT the history of mankind, exploitation of man by another has mutated, taking on more and more sophisticated forms. In recent African history, there was the slave trade where millions of Africans were shipped across the Atlantic Ocean to work in sugar and banana plantations in the Caribbean and the cotton fields of America. The method of operation was the use of brute force to capture Africans and to coerce them to work on the plantations, exploiting their labour to the optimum. There was a time when the slave trade accounted for 70 percent of England’s GDP. When the profits began to dwindle because resistance to slavery had grown to such colossal proportions, slavery, as a form of exploitation, mutated and changed into colonialism. The slave trade was finally abolished in 1833. The Berlin Conference of 1884 was a meeting by European powers to respond to the difficult economic circumstances created by the abolition of slave trade. We must remember these were countries, for instance England, whose entire economy rested on slavery and the slave trade. The Industrial Revolution was funded by profits from slave trade. Therefore, the Berlin Conference created rules for the Europeans to peacefully divide Africa among themselves for purposes of colonisation. Another form of exploitation had to be worked out. Colonisation was a more sophisticated form of exploitation than slavery because it appeared to care about the welfare and wellbeing of the colonised. It is a natural law that oppression breeds resistance. So once again there was resistance to colonialism and when that resistance assumed untenable proportions, as was the case during our own liberation war, colonialism attempted to save itself by mutating into another deceptive form of exploitation called neo-colonialism. The tricky bit about this form of exploitation is that it is with the apparent acquiescence and agreement of the local population. This is the most difficult form of exploitation to deal with because the enemy has disappeared into your ranks and becomes one of you. It is during this stage that we find neo-liberals and the neo-liberal agenda. The neo-liberal agenda is neo-colonialism. Therefore the fundamental question to ask becomes: What then is the position of the Zimbabwe Defence Forces in circumstances of neo-colonialism? In order to understand that position, we have to know where the Zimbabwe Defence Forces came from. Theoretically, the ZDF is a merger of the liberation forces from ZAPU and ZANU and the Rhodesian Security Forces. That was 30 years ago and everyone knew it was a difficult arrangement to end the war. Therefore, fundamentally, the ZDF emerged out of the people’s determination and resolve to dislodge British colonialism and Rhodesian fascism and free themselves. It is a myth and unrealistic to imagine the ZDF can be apolitical and serve under any political agenda because it was born out of a people’s political determination and yearning for freedom. Therefore its creation was a deliberate political decision. The Zimbabwe liberation forces were created to fight and dismantle the Rhodesian colonial state and replace it with a state owned and controlled by the formerly oppressed black people of Zimbabwe; a state guided by the liberation movement and defended by the liberation armed forces that now formed the core of the ZDF. The primary function of the ZDF is to defend the liberation war agenda. What was this liberation war agenda? It was a political programme that included, among other things, giving back the land to the people. It was not accidental that the calls for security sector reforms were loudest during the Land Reform Programme. It was a deliberate neo-liberal attempt to drive a wedge between the armed forces and the people, to sway them away from their sworn mandate to defend and protect the interests of the people. The security sector reforms were intended to replace the army’s top commanders with pliable officers who could be used for neo-colonial purposes and in our case to subvert the Land Reform Programme. It is not disputable that it was the open support by the security forces that ensured the success of the Land Reform Programme. There is nowhere in the world where the military and other security services are apolitical. During the days of the British Empire, the army was there to ensure the defence and protection of the British Empire whose resources accounted for more than 60 percent of the UK’s total GDP. As we gather here now, the Middle East is burning because of the West’s desire to control the region’s huge oil reserves. There was a time when the American forces in Iraq numbered over 150 000 men and women. An army that does not have a political mandate is a mercenary outfit. The American army defends American global interests. Neo-liberals are the foot soldiers of Western imperialism. Their purpose is to confuse and slow down or completely stop the national agenda. In Zimbabwe’s case, they make weak and unconvincing noises in support of the Land Reform Programme and condemn unreservedly the supposedly ‘chaotic’ manner in which it was carried out. The late Mozambican president, Samora Machel defined the state as the organised form through which a group of people take power to fulfil their interests. But he quickly added what is more important is the capacity and ability of that group of people to defend the state they have established in order to perpetuate their interests. Without a military that shares the same national vision to defend it, the state is in danger of being snatched away by neo-colonial forces in the guise of neo-liberals. 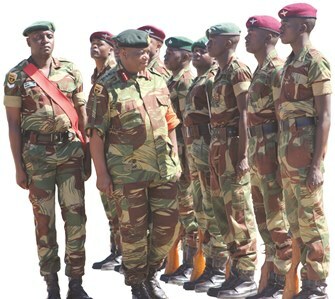 Because there is apparently no effort being made to create revolutionary base of cadres to defend the revolution and its gains, Zimbabwe’s security services sector and the war veterans have remained the sole vanguard of the revolution. Thirty years after the liberation war and several serious threats to the continued survival of the revolution, it still appears there is no interest to integrate the education that was taught in the camps during the war with the education back home. This is certainly an area where the neo-liberal agenda is succeeding.